Editable royalty-free map of Luxembourg in vector-graphic online store. SQUEEZED BETWEEN Germany, France, and Belgium, the Grand Duchy of Luxembourg is a tiny state. It has the highest standard of living in Europe and is famous as a center of international banking and finance. 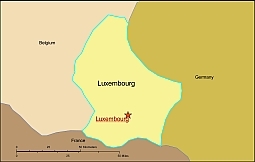 Despite its small size, Luxembourg plays a vital part in the European Union. Home to headquarters of major EU institutions, it hosts the European Court of Justice and the secretariat of the European parliament.